‘Statement’ sport coats call for sharper pants. This look is from Macy’s. The other afternoon, I spotted a guy wearing emerald-green pants. I couldn’t miss him, really, nor do I recall what he wore on top. A sport coat, I believe, but I was somewhat distracted by all that green. Those pants immediately took me back to 1980, when I knew plenty of preppy guys (and girls) who wore colorful pants. On occasion, even my father and brother sported them. Party pants, I used to call them. Several seasons ago, colorful jeans were a trend for juniors and women. Shortly after that, it seems, we started reading about colorful chinos for men. Now, I’m seeing vibrant pants right outside my window. The first warm days in April must bring them out. Last May, Sam Grobart wrote a story for Bloomberg BusinessWeek called “Bright Pants Will Change Your Life.” Grobart is a fan of colorful pants, and while he encouraged men to try the look, he also offered some tips and warnings about doing so. Regarding wearing them to the office: “To the degree that your office has a dress code, official or not, you’re likely breaking it. You’re calling attention to yourself, so make sure your work is getting done,” he wrote. Or as custom clothier Tom Barnett put it: “You don’t want to look like that guy from ‘Caddyshack,’ ” referring to Rodney Dangerfield’s character, Al Czervik, in the 1980 comedy film. Loud patterns aside, there is much to discover about this new generation of colorful trousers. As Barnett pointed out, men have many, many more options for building a casual wardrobe these days, and color has evolved right along with that. Sport coats have gone far beyond the basic navy sport coat of the past, said Barnett, owner of Tom Barnett Custom Tailored Clothing in Snyder and New York City. “Today’s sport coats make a statement; they have much more flavor and color. 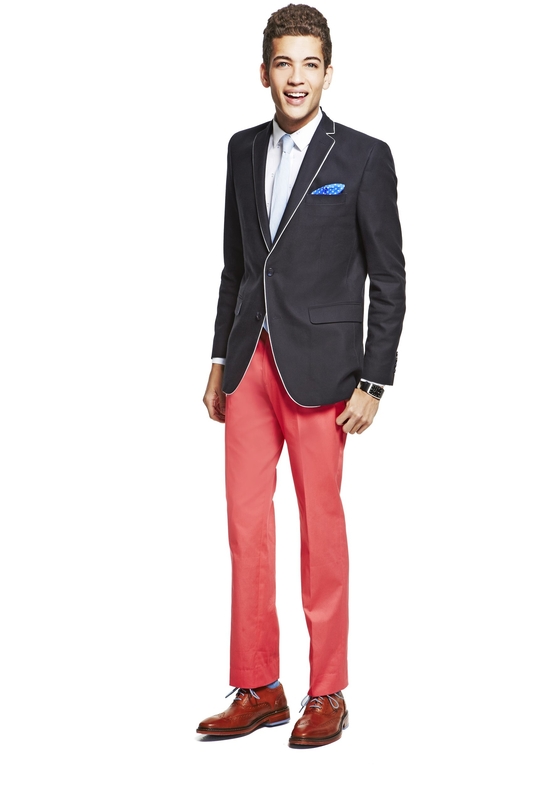 The pants are picking up the more subtle colors in these new sport coats. There are new tones of colors but with vibrancy. The pants tell a story,” he said. The latest chapter: “What used to be shirt colors are now colors in pants – pistachio, soft pinks, deep-coral pinks, deep rich purples, brick reds,” he added. Barnett made another point about trousers: “Not only have the colors changed, the fit also has changed dramatically,” he said. “Now guys are wearing pants with a shorter rise. They sit lower on the hips and the fit is trimmer through the hips, trimmer through the knees and shorter in length. There is less break on the shoe,” Barnett said. Nor is color found only in chinos. Light-weight blends in linen, silk and wool or even superfine corduroy suitable for spring offer other colorful options. I think that guy wearing emerald-green pants outside my window was really on to something.